730.00 EUR max. 1 Pers. 1165.00 EUR max. 3 Pers. 1850.00 EUR max. 4 Pers. The engine starts and the rotors swirl strongly wind. Just after the start you will see the Bodensee. From Bregenz to up to Constance. We fly directly towards Meersburg, which is impressive on a slope and its castle stands out magnificently. The next highlight is the island of Mainau with its beautiful flowers and the old worthy palace and buildings. Next you go along the lake ridge direction Bodmann to Radolfzell. Here we set the compass again to the east and fly over the island of Reichenau over the beautiful town of Konstanz and his Munster back to Friedrichshafen. From there is the lake of Constance at our feet. Surrounded by the Swiss Alps in the south and the Santis - the mountain of the region. 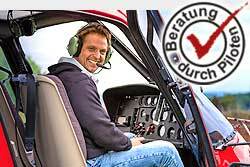 Robinson R44, EC 120 / Jet Ranger, Ecureuil AS350 depends on the starting point.